Anyway, I got caught up on the fresh stuff so onto the frozen stuff. 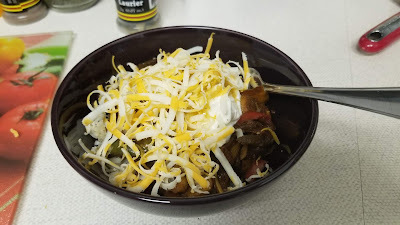 However, you can obviously use fresh peppers and onions for this recipe, I just happened to have a frozen mix of red, green, and yellow peppers, and onions that was perfect for fajitas! I also had fresh mushrooms that needed to be used so I sliced those babies up and sauteed them in olive oil for a few minutes before adding the frozen mix. I used my Epicure fajita seasoning mix but it can be replaced with a homemade mix or store bought, whatever works for you. I feel like I've been stuck in a slump the past few months just making the same things over and over again. I forgot about making sushi until a few weeks ago and I've had it 3 times now. 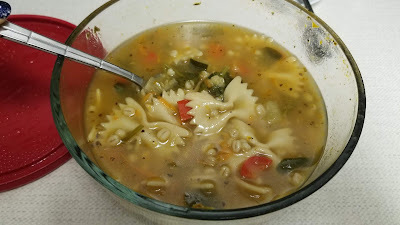 It's SO easy to make and you can put literally anything you want in it. I like to use what I have on hand and most of the time I go with avocado, bell pepper, carrot, and cucumber. I like to julien everything so it's easier to roll up. I do have a sushi mat but you can use plastic wrap to assist you and make less of a mess. 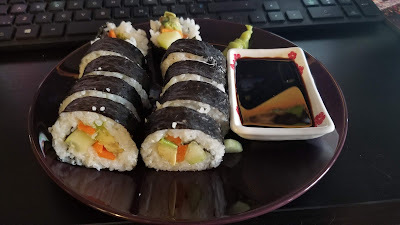 You can use any rice but I happened to buy sushi/sticky rice. If you don't have sticky rice you can mix in rice vinegar and sugar to assist in making it sticky.